Standing against the boards, a 6-foot-3, 220-pound, 21-year-old hockey player. Chinstrap undone, pucks at his feet, focused on the battle ahead. Then come several light taps on the glass. Nervous ones, but hopeful. 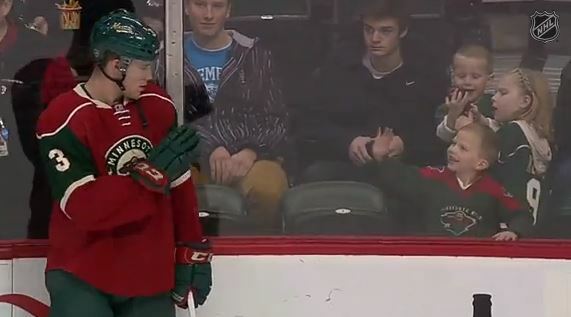 Minnesota Wild forward Charlie Coyle maybe due to excellent hearing or just the slightest glimpse out of his peripheral vision found the source of the faint claps to the glass and turned ever so slightly to get a look at a young fan desperate for acknowledgement. Coyle gave a simple wave to the awestruck little fellow and a wry grin before going back to preparing to do the job he’s paid handsomely to do. It wasn’t much, but it was everything. You can try to watch the video and not smile to yourself, but you’ll fail. Maybe you’ll feel the need to share it with others, as I did, knowing that it will bring some amount of joy to anyone who sees it. This is a scene that may play out more than we realize over the course of a season in professional sports. Maybe it doesn’t happen enough. We were just lucky enough the cameras were rolling to catch Coyle’s seemingly innocuous act lead to such a priceless reaction. It’s funny how something so ridiculously simple can trigger such a positive emotion not only for the young man in Minnesota, but anyone who sees it. If it didn’t take you back to your own childhood and the feelings you had about sports or pro athletes then, I’d be surprised. As we get older and especially now in the way sports is covered and followed, it becomes incredibly easy to forget that at their very heart, the professional sports we follow and/or cover are games. For a lot of young kids like the one in Minnesota, there’s some magic left. It seems as though in this era of sports media consumption and coverage, a lot of that magic is getting lost. It’s only natural when we get older, the shine on sports and our heroes fades. Sometimes it’s just out-growing that childlike wonder. In the Twitter era, sports are more easily boiled down to 140 snark-filled characters, GIFs and screen grabs. As fun or funny as those can be, they’re fleeting moments in our daily sports consumption. There’s less room for those lasting ones. We also have more information than we could ever want on every player and team it seems. Good stories or surprising results can’t just be that anymore, they have to be run through the ringer and every statistical formula. There’s nothing wrong with any of those things. The amount of information available to the average fan is greater than ever before, and with that can come an increased understanding of the games as a whole. But in that we lose a little bit of the mystery and the inexplicable. That, in turn, takes away some of the fantasy and romanticism that we build our sports fandom on as children. Maybe in today’s landscape there’s not enough room for those things. At least not to us adults, the ones who so often take the joy out of sports and replace it with crushing cynicism or worse, an insatiable need to be outraged about someone or something. In hockey, it seems it is a constant debate. Whether it’s fighting or advanced stats or concussions or expansion or lockouts, there’s no shortage of topics to pit us all against each other. But then you look at the kid’s face, hand cupped over his mouth concealing the toothiest grin you may ever see and perhaps a giggle or two. You remember why you fell in love with the game and why you idolized the players and why you still care. At one point, we were all that kid in Minnesota. No agenda, no anger, just excitement and curiosity. I remember two things about the first NHL game I ever saw. It is one of my earliest memories. The first is my dad shielding me from a fight that broke out among the over-served in the mezzanine at the old Chicago Stadium sometime in the first or second period. The second and most vivid is meeting Hawks defenseman Keith Brown, who I believe was out with an injury. As a 4-year-old, he seemed like a giant to me. He shook my hand and talked to me for a bit, and I have no idea what he said. I just remember being really excited about it. He signed a wooden mini stick with the only thing we had available — a ballpoint pen. It took a few years, but that signature eventually faded away into the cheap wood. I believe that stick still resides somewhere in my parents’ boxes of belongings, tucked away, but never forgotten. Brown remained my favorite player until Chris Chelios arrived in Chicago a few short years later. I liked Chelios because he too was from Chicago and his name was Chris. Kids, man. I still followed Brown’s career though. He played 14 years with the Blackhawks and closed things out with the Florida Panthers. One of my earliest memories is hockey-related. Here I stand 25 years later still in love with the game, but perhaps in a different way. Occasionally I’ll get those twinges that makes me feel like a kid again, but in the constant rush to meet deadlines and constantly think of new ways to cover this angle or that, hockey is more of a job. It’s a fun one, but there’s less room for pure enjoyment and all-out fandom. Watching that video of Charlie Coyle waving to the young Wild fan took me right back to the bowels of Chicago Stadium anxiously awaiting Mr. Brown to sign my mini stick, though. I remember the nerves I felt, unsure of why I felt them. I remember feeling the excitement. I don’t remember who the Blackhawks played without looking at the stub my dad saved for me — it was the Maple Leafs. I don’t remember the food. I do remember the fan fight, but more than anything else, I remember Keith Brown taking the time to be nice to a really excited little kid. There’s a lot wrong with professional sports and hockey itself right now. It’s not all bad, though. It never will be. As long as there are games to be played and fans to play them for, there will be minds captivated and dreams forged and in that, there is magic. One simple wave. It’s not much, but it’s everything. This entry was posted in Grow the Game, NHL. Bookmark the permalink. Thank you Chris! I shared it with my wife who is oh so sick of my ‘Hey! look at this amazing/funny/unbelievable/stupid hockey-related video! Its a good one!’ schtick and of course she loved this one as much as I did! Where’s the “love” button. It was not enough to just like it!